Nirmidas Biotech Inc. is proud to announce the availability of our pGOLD multiplexed assay kits for the rapid detection (< 2 hours) of antibodies against a panel of infectious diseases. Our assay kits use a ultra-low volume of patient sample (2-5 ul) for simultaneous detection of different antibody sub types (IgG/IgM/IgA). Our assay kits are compatible with MidaScan/MidaScan-IR scanners and other existing fluorescence based microplate readers. 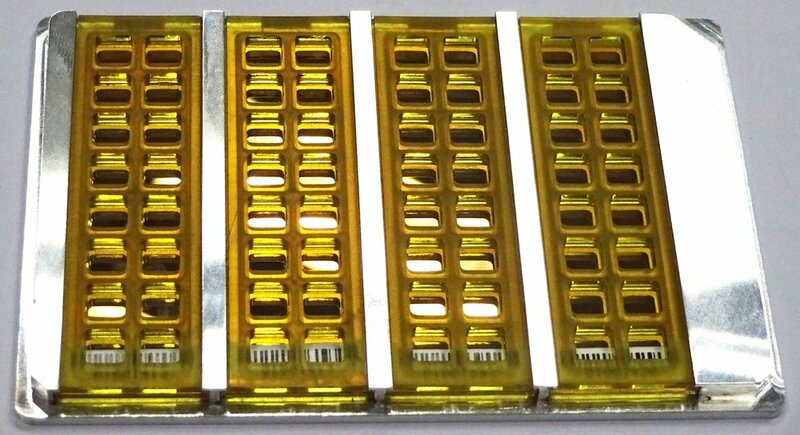 In each microarray module, a panel of infectious disease antigens are immobilized on pGOLD surface in triplicates. During assay procedure, test samples are incubated on the microarray, where different isotypes of human antibodies if present, will be captured by corresponding antigens. Following labeling by dye-labeled (multi-colored) capture antibodies, the microarray module is scanned with a fluorescence microplate reader. Fluorescense signal and intensity at specific antigen spots correlates to the amount of specific antibody isotypes present against the corresponding antigen. Each assay contains 4 biochips and can test up to 56 samples including controls. Nirmidas Biotech Inc. announces the availability of three pGOLD-Zika/Dengue IgG/IgM/IgA Assay kits for rapid, simultaneous, multiplexed detection of IgG, IgM and IgA antibodies against Zika virus (ZIKV) and Dengue virus (DENV), each requiring only 1 micro-liter of patient sera. A unique IgG avidity test against both ZIKV and DENV is also developed. These assays, published in the March 6 issue of Nature Medicine can facilitate differentiating ZIKV from DENV infection, and revealing whether the infection occurred recently (low avidity) or in the past (high avidity) for both Zika and Dengue infections. The current Zika diagnostic tests are non-ideal due to narrow diagnostic window (RNA detection by PCR), cross reactivity (Zika IgM test) or time-consuming and laborious procedures (plaque reduction neutralization testing, PRNT). The simultaneous ZIKV and DENV IgG/IgA testing, enabled by the pGOLD assay, is novel with an important finding that the cross-reactivity problem between ZIKV and DENV IgG and IgA antibodies occurs at a much lower degree than IgM antibodies, thus allowing highly specific diagnosis of ZIKV infection and differentiation from Dengue infection. ZIKV IgA positivity is found to be highly specific to early stage ZIKV infection. For a ZIKV infected cohort with symptom onset to sample collection time of 2-90 days in the acute-convalescent phase, the pGOLD IgG/IgA test can diagnose ZIKV infection with > 90% sensitivity and ~ 98% specificity, with little cross-reactivity problem due to chronic or on-going DENV infection. For an acute-phase ZIKV infected (< 6 days after symptom onset, positive by PCR test) cohort from the Dominican Republic, the pGOLD IgG/IgA assay can still detect ~ 47% of the ZIKV infection. IgG and IgA are reported by two different colors of fluorescence. IgG and IgM are reported by two different colors of fluorescence. IgG is reported by 800 nm NIR fluorescence. Each sample will be tested with and without urea treatment. pGOLD assay is in a format similar to multi-well microplates widely used in ELISA and can be considered as multiplexed ELISA with very similar assay procedures. Automated washers are readily available and can also be processed manually. Plate reading can be done by MidaScan reader offered by Nirmidas for best results or use existing fluorescence readers. Perform ZIKV/DENV IgG and IgM antibody test; and ZIKV and DENV IgG avidity test. Avidity test can identify if the patient had prior ZIKV or DENV infection. For primary infection without prior flaviviral infection, ZIKV IgG/IgM test can detect ZIKV infection in acute, convalescent and chronic phases. Perform ZIKV/DENV IgG and IgA antibody test; and ZIKV and DENV IgG avidity test. For patients with prior DENV infection as is the case for adults in dengue endemic regions, ZIKV infection would be considered as secondary infection. ZIKV IgG/IgA test can detect ZIKV infection in acute, convalescent and chronic phase. Secondary DENV infection can also be detected by pGOLD IgG/IgM and avidity test. Nirmidas is developing a multiplexed IgG/IgM and IgG/IgA as well as IgG avidity test for ZIKV, DENV, JEV, YFV, WNV, CHIV, BEV and USUTU. The assay will require only 1 micro-liter of serum or whole blood for simultaneous detection of all major flaviviral and alphaviral infections. Nirmidas is open to collaborations on customized assays on the pGOLD platform, with any antigens provided by the customers in single-plex or multiplexed formats for diagnosis of infectious and other diseases. Nirmidas provides testing service for flaviviral infections at a highly affordable price. Nirmidas Assay Kits are available and customizable. Email us at sales@nirmidas.com or fill in the form below. Available to purchase. Email us at sales@nirmidas.com or fill in the form below. Available to purchase. Email us at sales@nirmidas.com for more information or fill in the form below. We'll reach out to understand your needs and show you how Nirmidas Multiplexed Assay Kits can support your research. Thank you! We'll get in touch you regarding your inquiry. With your permission, you'll be notified of new developments. You'll receive an email shortly. "A plasmonic chip for biomarker discovery and diagnosis of type 1 diabetes” Nature Medicine, 20, 948-953, 2014. "An Integrated Peptide-Antigen Microarray on Plasmonic Gold Films for Sensitive Human Antibody Profiling" PlosOne, Published online July, 2013.